Easy and Enjoyable. 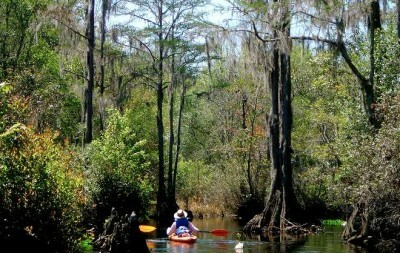 There will be lots of time for instruction and folks wanting a break from paddling have a houseboat at their disposal. 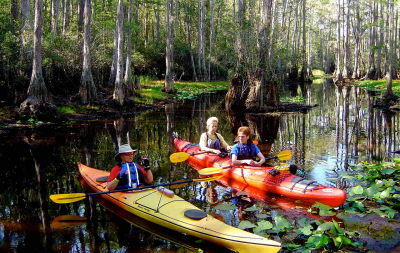 Guides, airport shuttles, meals on the water, permits, kayaks, and all needed kayaking gear. Houseboat with bathroom and shower facilities. 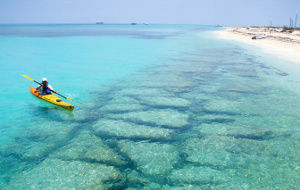 Enjoy a week of paddling a desert paradise all the while having the creature comforts of home onboard our 53′ houseboat. 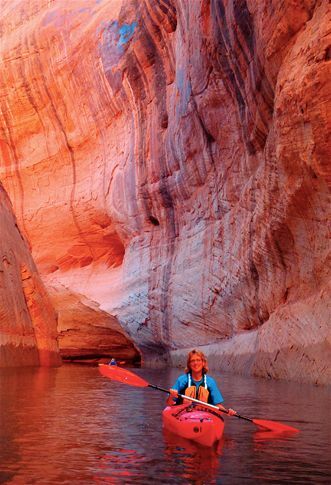 Explore slot canyons, cliff dwellings, and rock art while paddling far from the mainstream of Lake Powell. Day 1 — Our trip begins on the 16th, however, folks should fly into Salt Lake City a day early to avoid any delays or lost luggage. After breakfast we will drive 4 hours through southern Utah towards the Bullfrog Marina on Lake Powell’s north shore. 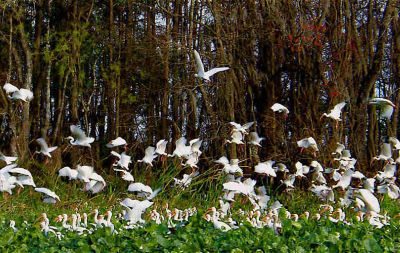 The further south we travel, the more dramatic and colorful the scenery becomes, as the rugged and remote Henry mountains loom to our west. Dinner and our houseboat await us at the marina. We will load up, get some instruction on houseboat manners then find the perfect canyon to park the boat, go for a swim, and spend the night. Day 2 — After breakfast we’ll load up and set out for the main channel of the Colorado River. Traveling southwest along the river, we leave all civilization behind and are greeted by the splendor and solitude of our wilderness home for the next week. Most likely our first backcountry anchorage will be tucked in a narrow canyon just off the Colorado River. 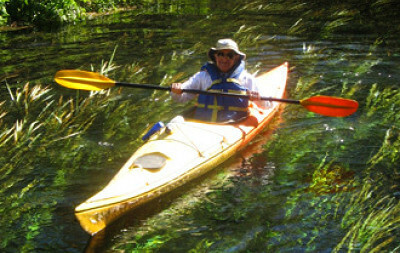 While you and one of the guides goes kayaking or swimming the other guide will be preparing happy hour and dinner. Since our houseboat comes with two refrigerators, you can be certain there will be plenty of fresh salads, fresh prepared fruits, and from “scratch” meals. Day 3 — In the morning we will cruise to our next anchorage near Pollywog Bench. Located in the amazing Escalante Arm. 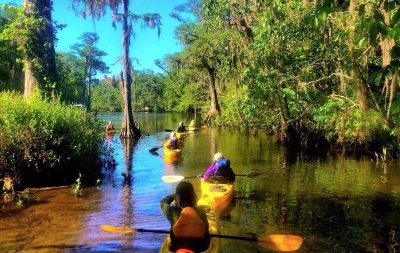 At camp the guides will unload the kayaks, give a brief safety talk and paddling demonstration, then begin our exploration of Clear Creek where we will be awed by the soaring walls and arching roof of the cathedral in the desert. The warm, reflected desert light is especially vibrant in this deep, narrow canyon and hints at the many fantastic geological phenomena that we’ll encounter during the week. 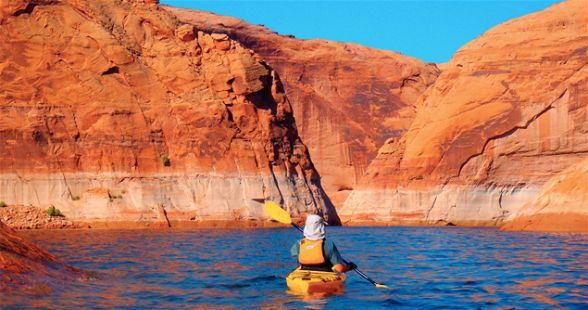 After visiting the cathedral we paddle back to the Escalante Arm to explore a number of additional side canyons before heading back to our floating home for dinner, cocktails, and a sunset celebration. Day 4 — After a morning swim and a giant breakfast, we paddle into Davis Gulch, exploring deep alcoves and caves where ancient rainwater drips from porous sandstone ceilings. The canyon gets narrower, and the walls get higher, as we make our way even deeper into the gulch. At the lake’s end we will ditch our kayaks and hike the sandy creek bottom to Lagorce Arch, high on the canyon wall in the middle of an enormous alcove. Lunch will be above a nearby waterfall then hike in search of petroglyphs. Before nightfall we will go back to our kayaks and paddle home. Day 5 — Today we leave the paddling behind and lace up our hiking boots. We will hike right up from camp following an old miners trail up to the rim of Pollywog Bench. While enjoying the colorful lake below us, we’ll play on the sandstone hills filled with Moqui marbles and yucca plants en route to the perfect scenic overlook. 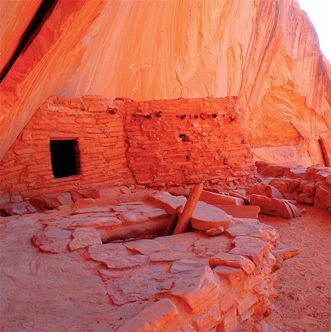 Upon reaching our destination, the mirage-like beauty of the surrounding landscape, considered sacred to the Navajos, unfolds before our eyes in the most perfect panorama. Perfect location for a perfect lunch! We will make it back to camp in time for a cleansing skinny dip in the lake before another amazing dinner off the grill. Stars always look better with a full tummy and a cold drink. Day 6 — By now you’ve realized that the time to get up and moving is when the aroma of coffee saturates the boat and the sun is just about to rise. Enjoy your coffee on the upstairs deck and watch the sun paint the canyon in a million shades of color. 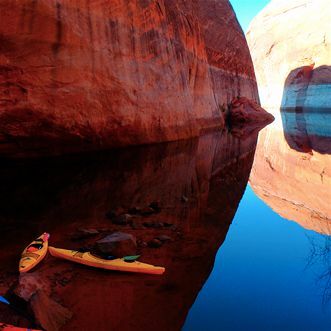 The rest of the day will be spent kayaking deeper into the Escalante and make our way to fifty-mile canyon, where we’ll portage our kayaks a short distance over a small sand dune to a trapped lake that has been cut off from the main pool of Lake Powell. Day 7 — We enjoy a relaxing breakfast in the super silence before a final morning exploration and good times in the Lake Powell backcountry. 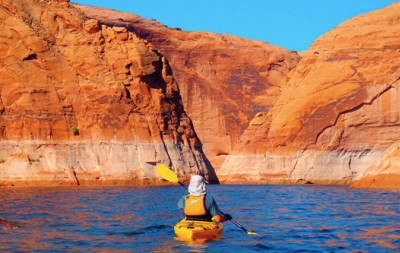 Time to get your final glimpses of the high painted desert walls in amazing contrast to the deep electric blue waters. Dropping off the houseboat then beginning the long haul back to Salt Lake City. To break up the drive we will stop at our favorite ice cream shop and a possible picnic lunch in Goblin Valley State Park. A “Google” image search prior to our visit will give you a great preview of these amazing sandstone sculptures. Expect to arrive back at the airport around 4-5pm. If your hotel is close to the airport your guides will happily drop you off there. Please remember to always pack essential items such as appropriate identification, money, eyewear, a change of clothing, hiking boots and medications in your carry-on baggage, in case your luggage is delayed. Purchase any beer, wine or spirits on the night you arrive in Salt Lake City. There is no alcohol sales in Utah on Sunday, really. The walls between bedrooms are thin, bring ear plugs. Last year most folks ended up sleeping on the houseboat roof for the star gazing. On any live aboard vessel quarters are tight and privacy is rare. It’s important that people are comfortable and experienced in group travel. Good manners are essential! If you have dietary restrictions please make them very clear by calling us as soon as you sign up. 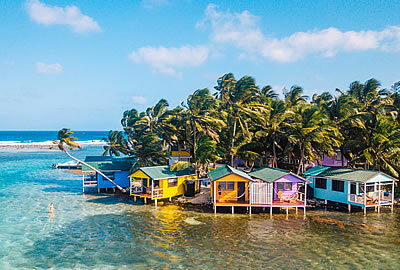 Our houseboat is fully furnished with freezers and refrigerators, this means we will enjoy lots of fresh fruits, veggies, and satisfying meals made from scratch. Our houseboats has two bathrooms with hot water showers, 4 bedrooms with double bed, and a pull out bed in the living area. Most folks end up sleeping on the roof of the houseboat or bring a tent to set up on shore each night.